A common mistake in digital marketing is the “cold sell,” when companies ask customers to spend lots of money in their first interaction. A negative experience at any step in the sales process—poor customer service, a lack of clear information—could sour their relationship with your brand. Targeted digital advertising offers a powerful tool to build relationships with customers more likely to buy more and more often— nurtured leads make 47% larger purchases than non-nurtured leads, according to Marketo. A clear understanding of the buyer’s journey can help you target the right customers at the appropriate moment to ensure they have a seamless, fulfilling experience with your brand. 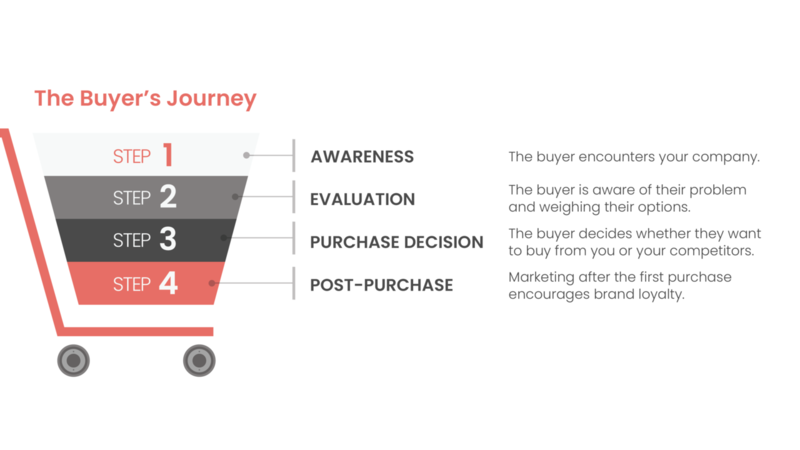 The buyer’s journey refers to the path the customer takes from the first time they become aware of your business through their evaluation process as they decide whether or not to make a purchase. The buyer’s journey is shaped by the accumulation of brand touchpoints, or interactions with your brand. The ads, Tweets and conversations with sales representatives shape the customers’ overall experience and impact their final purchase decisions. By looking at the journey as a whole, you can identify opportunities and address any “gaps” where the customers’ needs aren’t being met. Thorough knowledge of the buyer’s journey can lead to growth and strengthen your overall sales process. The first stage of the buyer’s journey is when the customer first encounters your company. This can be one of the most difficult tasks; according to HubSpot, 61% of marketers say generating traffic and leads is the top challenge they face. Content in this stage should be informative, providing answers, research and insight. These potential customers are seeking to learn more about a problem they face, or just beginning to identify their problem. In 2018, more customers than ever were using the Internet to find and choose between purchase options— 81% of customers research online before they buy, according to AdWeek. Paid search and SEO: With targeted search ads and an optimized website, you can ensure that customers searching for similar products or topic on Google will find your company. Google and web analytics can help you identify keywords and search terms that your current and potential customers are using. Social media or other online ads also rely on your keywords and appear organically in the user’s digital world; these ads are opportunities to target customers who are already interested in your products or offerings. Blogposts and social media content can speak to customer’s needs and concerns. Educational content helps you demonstrate to potential buyers that they have a “problem” that needs to be solved and you’re the one to help solve it. Companies that blog are 13 times more likely to have a positive ROI, according to an article in Entrepreneur. In this stage, the customer is aware of their problem and weighing their options. Customers can get 60% of the way through a buying process before they’re ready to talk to anyone about making a purchase, according to Gartner. They conduct more intensive, in-depth research, and compare their different options. In this stage, it’s important to communicate why your products or services are specifically a good fit, and how they address the customer’s needs. In this stage, companies want to build deeper relationships and trust with potential customers. Acquiring emails and contact information allows you to reach out to customers on a personalized, one-on-one level, and deliver information specific to their needs. 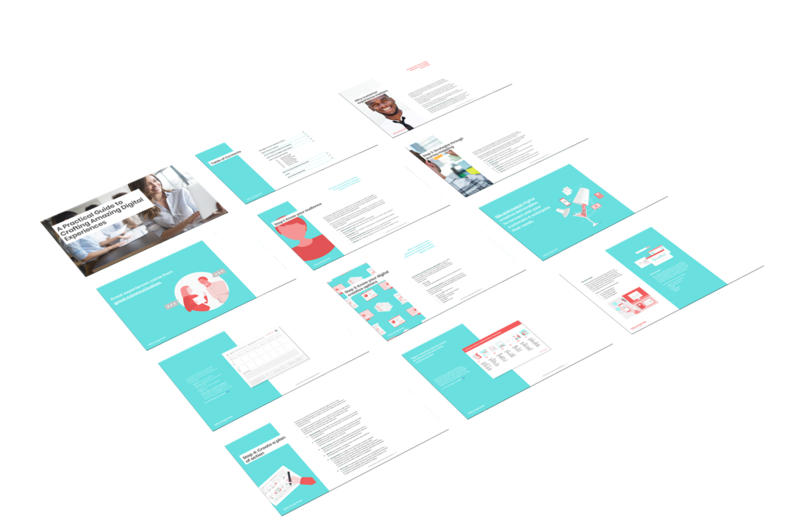 Lead capture: Ask your customers to share their contact information while sharing valuable content in the form of newsletters, webinars or white papers. Customers have the tools for deeper research, and you can continue to nurture this relationship. Website optimization: Beautiful, engaging content—videos, articles, or infographics—makes it pleasurable and intuitive for your customers to engage with your brand. In this stage, customers decide whether or not they want to make the purchase from you or your competitors. Clear, targeted calls to action are important here: are these new customers, or repeat ones? What services or deals would be most appealing to them? Demos: Ask customers to invest a small amount of time or money to increase their engagement with the brand. For example, a free trial period or a discount rate for new subscribers allows you to continue to build your relationship with the customer before they decide on purchasing your core offering. Enjoyable buying experience: Ensure the online purchase portal is intuitive and engaging with project samples, high-quality images and videos, and easy to navigate menus. Marketing is just as important after the first purchase to encourage brand loyalty and extend the relationship. Brand advocates will spread awareness through word of mouth and referrals, and customers find these personal recommendations valuable. According to HubSpot, 55% of customers use word of mouth to make buying decisions, and 46% use other customer reviews. Satisfied buyers will leave reviews on Google or Yelp and encourage their friends to work with your company. Customer service and onboarding: 87% of consumers say customer service impacts company trust, according to Edelman Insights. Onboarding materials and continued support can educate your customer on how to use your service and humanize your brand. Feedback surveys: The best source of information is your customer. Gather information to further improve the buyer’s journey or capture positive reviews that you can use in your own marketing materials. Brand interactions are growing more complex in the digital era—the number of touchpoints is increasing by 20% annually, according to McKinsey. To better understand the current customer experience, map out your brand touchpoints and look for places where the customers could be getting more from your team or process. Look at the effectiveness of each interaction from an outsider’s perspective: what is your website user experience like? Is your social media presence valuable? Are you addressing all of their needs? By searching for gaps and opportunities, you can identify where to concentrate your marketing budget and energy to deliver the most growth for your business.